Fiber Flux: Free Crochet Pattern...Kitchen Lovelies! Are they trivets? Coasters? Dishcloths? Yes, yes, and yes! These pretty and functional little numbers will be your go-to item in the kitchen, whether you grab a few to protect your table or use to fabulously wipe up a spill, they are hardworking yet beautiful accessories for any kitchen that needs a little handmade loveliness! This pattern includes instructions for a basic round with four different and easy to stitch edgings. Foundation: Chain 6 and slip stitch into the first chain to form a ring. Round 1: Make 12 dc into center of ring, join with a sl st to join round. Round 2: Ch 2, *2 dc into the next stitch, repeat from * to end of round. Round 3: Ch 2, *1 dc into next stitch, ch 1, repeat from * to end of round. Round 4: Ch 2 *2 dc into the next stitch, repeat from * to end of round. Fasten off...now on to the edgings! Round 1 (shown here in pink): Tie on a new color and in each space, sc around the whole circle in each space. Join with a slip stitch and fasten off. Round 2 (shown here in purple): Tie on a new color and ch 4, skip the next 2 spaces, then in the next space, sc and ch 4, skip 2 more spaces, and in the next space, sc and ch 4. Continue in this manner all around until you reach the end and join with a slip stitch. Round 3: With the same color as round 2, in one of the loops you've just made and in that space sc, sc, sc, ch 2, sc, sc. Repeat this step in each loop space all around. Join with a sl st, fasten off and weave in any ends. Round 1 (shown here in purple): Tie on a new color and in each space, sc around the whole circle in each space. Join with a slip stitch and fasten off. Round 2 (shown here in pink): Tie on a new color and in the first space, ch 2, dc, sc all in the same space *and in the next space sc, next space sc, next space sc, then in the next space sc, dc, sc all in the same space* Repeat from * all around. Join with a slip stitch, fasten off and weave in any ends. Round 1 (shown here in blue): Tie on a new color and in each space, sc around the whole circle in each space. Join with a slip stitch and fasten off. Round 2: (shown here in green):Tie on a new color and in the first space sl st, in the next space sc, ch 3, sc all in the same space. Repeat this sequence all around the circle. Join with a slip stitch, fasten off and weave in any ends. Round 1 (shown here in green): Tie on a new color and in each space, sc around the whole circle in each space. Join with a slip stitch and fasten off. Round 2 (shown here in blue): Tie on a new color and ch 3, 4 dc all in the same space, *skip the next space, in the next space sl st, skip the next space, in the next space 5 dc all in the same space. * Repeat this sequence from * to the end, all around until you reach the end of the round. Join with a sl st, fasten off and weave in any ends. I hope you enjoy these...I made several for a friend for a house warming gift, and I just know that I will be able to crochet some up whenever I need a pretty little gift in a pinch. Giving these as a gift? Here's a quick little tutorial on how to tag and wrap them up! More free crochet patterns here! How do I print the patterns with the advertising? very pretty items. I love the colors and so wish I could crochet. Jennifer, your patterns are wonderful-easy and easy to follow directions. Thank you and keep up the good work. Linda M.
These are beautiful and I am going to try them soon! Just getting back into crochet this Summer, and teaching myself new things. Just curious if you could tell what brand of yarn this is, and where you find it at? Seems the bright cotton colors are hard to find, at least where I have looked so far! Susan, I get my bright colored Sugar 'n Cream cotton yarn at Walmart. I've also seen them at Hobby Lobby, the Peaches 'n Cream line. I'm imagining these in Christmas colors to give to friends. :-) Thanks so much! Earlier this summer I pulled out my bag of cotton yarn leftovers and had a ball making a stack of these with all the bright colors I love. This last week I picked out four to take to my Red Hat Society dinner for a door prize. 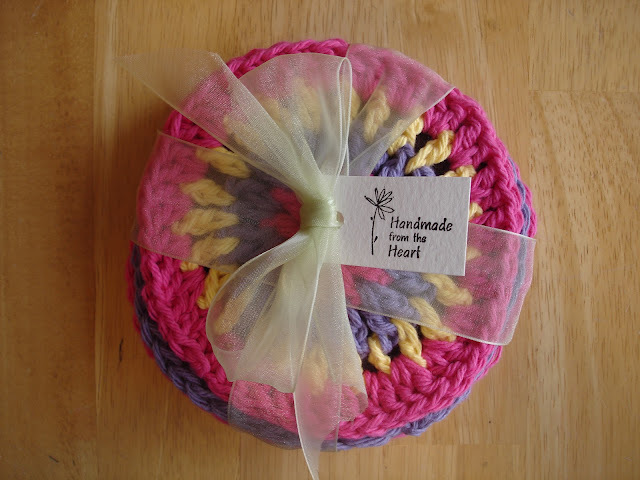 I attached a tag that said, "Kitchen Lovelies ~ dishcloths, hot pads, whatever ~ " They were a hit! The gal who won it is our one Pink Hat Lady, in her early 20s. The last I thing I heard her say was something about wall decorations! What a fabulous door prize! I gave mine away too, to someone who just moved into a new home. I need to make some more too! I have a question...should i join each round with a slip stitch? The pattern above says to join round 1 with a slip - do all the others join with a slip as well? hi Jeniffer, thankyou for sharing the pattern. I love the color so pretty. I think it's not problem if we do first with magic circle. Hi I loved your pattern very much .Can i have the permission to sell within my friends......They all loved when i made for myself . Hi Jennifer, I have what is probably a silly question. I am very new to crochet and I have followed your pattern (love it by the way) but it doesn't lay flat. It curls up into what looks like a cone. What could I be doing wrong? Am I pulling too tightly? Any advice would be helpful! Thanks. Did you count the ch 2 at the beginning for the round or is it just a "connecting stitch? and on round 4 it says 2 dc in next stitch but does it mean the ch 1 space? These are beautiful! Lily Sugar 'n Cream makes all of the bright colors. Michaels had them on sale last week for 97 cents per ball, and they have them fairly regularly for 4/$5. Hobby Lobby has more colors, and you can take their weekly 40% off coupon found online at their website. Does the ch 2 at the beginning count as your first stitch? Jennifer, You asked that we only use these for personal and charity use. I am looking for dainty things like this to use as a fund-raiser to sponser a little girl in India. Do you mind if I use these patterns if I give your name and website as the designer? I really appreciate your skill. These are lovely. Do you mind emailing me your decision? Thank you. Only thing I found disappointing about the pattern is that you don't seem to have it fully write out which could confuse some newer crocheters. But it is fast and easy to follow along to otherwise.